- Cash needs his diaper changed so we're gonna put him down here and take care of it. If you're a right-handed parent, you want to put the head at your left hand. If you're left-handed you want to put his head at your right hand. Or my husband diapers like this cause he's very brave, but I'm gonna stick Cash this way. And because Cash has had a stool, the first thing I'm gonna do, oh I'm sorry sweetie, I'm gonna hurry, is I'm gonna unfasten his diaper and I'm gonna make one quick swipe down to try and collect as much of the stool as I can. And then I'm gonna tuck the front of his diaper underneath his little tush. Now when you're cleaning up a baby that's under one month of age, many pediatricians suggest you don't use chemical wipes. Soap and water is their choice. 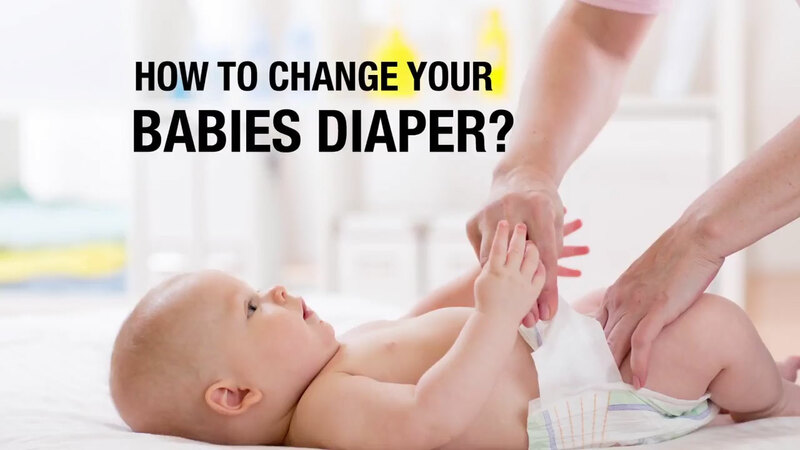 You never want to leave a baby on a changing table. You need water to clean them up, so a great tip is to get one of these air pots, fill it with water each day, and you have it right at your table. You don't have to leave your baby. So you just pick up a little cloth such as this, get it wet, put a little mild baby soap onto it, come over and you just gently remove the stool. You don't want to do a lot of rubbing because it can break down your baby's skin and promote diaper rash. You're just gonna gently remove stool. And then I'm gonna take another little cloth and get it wet. And I'm just gonna gently pat and rinse him off. Hi little guy. And then one more and dry him off. And with little boys, I've got this little cloth diaper handy because he may at some point decide to salute and spray urine all over the place so I just have this handy so I can cover him and keep the urine off the wallpaper cause I know your tricks, yes I do. I'll get you all dry. And then we're gonna pick up our nice clean diaper, and the tabs on these diapers are in the back. And you simply lift him by his ankles, slide the diaper up underneath his buttocks to where you think his waist is, but babies don't really have a waist. Open up the diaper. We're gonna spread it across his abdomen. And we're gonna fasten it. Here you go. Do you like these new diapers? Huh? You're being so good. There we go. Fasten, and you want to keep the ruffles out. There we go! Look at this. And we're done. We did a good job. Yes we did.